In praise of the debt snowball (28 Sep 2006) — When I started Get Rich Slowly, I had over $35,000 in consumer debt. I lived paycheck to paycheck on a salary of over $50,000 per year. Basically, I was your typical American consumer. 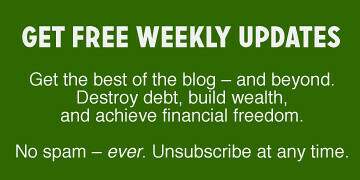 To get out of debt, I used Dave Ramsey's version of the debt snowball. A lot of folks want to complain that using this method is based on bad math, but so what? If math were the issue, I wouldn't have been in debt — and neither would many other people. The debt snowball works, and that's why I love it. Are index funds the best investment? (24 Jan 2007) — At first, I was a bad investor. In fact, I was a gambler, not an investor. I took chances on random stocks in the hopes they'd shoot through the roof. Reading and writing about money quickly taught me that pros like Warren Buffett (and many more) actually endorse a simple investment strategy for average folks like you and me. For us, putting our savings into indexed mutual funds is the most reliable long-term investment. You can't always get what you want (24 Nov 2008) — Notes from a conversation with my cousin: It's okay to have something in your life that you hate. And it's okay to have something you want. It's natural. The problem is that once you get that thing, you're just going to hate something else, you're just going to want something more. It's not want that's the problem, but the habit of constantly satisfying wants. In early 2009, I decided to listen to the offers from people who wanted to buy Get Rich Slowly. Shortly after the site's third anniversary, I agreed to sell it. When I sold, I became financially independent. (I was already on a path toward financial independence — or “FI,” as we say — but the sale helped me leap ahead several years.) My plan was simply to walk away and be done with writing about money. Turns out, I couldn't bring myself to do that. You see, I love the GRS community. I didn't want to leave. I wanted to continue answering emails, sharing reader questions and stories, and documenting what I was learning about money. Instead of walking away, I stuck around for another three years as editor and primary writer. I'd always stressed the importance of psychology; but as my financial philosophy matured, I became even more convinced that smart money management was all about mindset, not math. The math is easy. It's the emotional stuff that's tough. Some of the best articles from this era of GRS really get to the heart of these issues, and I hope that what I learned will be helpful to others, too. The razor's edge: Lessons in true wealth (18 Jan 2009) — This is perhaps the most important article I ever wrote for Get Rich Slowly, although most people would never know it. In early 2009, my best friend took his own life. It had a profound impact on me. Here I wrote about what I learned from Sparky's life — and his death. How to negotiate your salary (06 May 2009) — I don't think people spend enough time looking for ways to boost their income. There's a reason I mention this over and over and over again. Learning how to negotiate your salary is one of the best ways to improve your financial well-being. Action not words: The difference between talkers and doers (30 Aug 2010) — If there's something you want to be or do, the best way to become that thing is to actually take steps toward it, to move in that direction. Don't just talk about it, but do something. It doesn't have to be a big thing. Just take a small step in the right direction every single day. America's love-hate relationship with wealth (14 Nov 2011) — While writing about money, I've noticed that people in general (and Americans in particular) have a complex love-hate relationship with wealth. People want to be rich — but they're suspicious of those who already are. Why is that? How can we learn to be happy for the financial success of others? Eventually, after three years of lingering at GRS, I reached the point where I was willing to cut the cord. I gradually reduced my involvement until I was ready to walk away. I eased myself out of the site and into the life I'd been hoping to pursue. In 2010, I published Your Money: The Missing Manual. (I'm proud of that book but it's sorely in need of an update.) From 2011 to 2014, I wrote the “Your Money” column for Entrepreneur magazine. In 2014, I released the Get Rich Slowly course. In 2015, I started a new site called Money Boss (which is now a part of GRS). And so on. All you need to know about saving for retirement (15 May 2013, by Robert Brokamp) — Before I left GRS, I brokered a deal with the Motley Fool that brought regular contributions from the hilarious (and smart) Robert Brokamp. He contributed many terrific pieces over the years, but I particularly like this crash course in retirement savings. If you're wondering where to start, start here. You are the boss of you: How to find success with money and life (01 Aug 2013, by J.D. Roth) — I've always said that nobody cares more about your money than you do. But I've come to realize that nobody cares more about you than you do. The key to success — in every area of life — is to understand that you control your own destiny. If you want to be successful with money and life, you must act as your own boss. How to track your spending (and why you should) (24 April 2014, by Holly Johnson) — Holly is another one of the great staff writers that GRS hosted during the Quinstreet years. (I'm excited because she's promised to give me a guest post soon about some of her home improvement fiascos. Should be fun!) I like this article, in which she takes a friend to task for not tracking his spending. He and his wife make a lot of money but they're constantly broke. Why? Because they have no idea where there money goes. 29 Ways to build your emergency fund out of thin air (18 Jan 2016, by Donna Freedman) — Donna has contributed a lot of great articles to GRS over the years. (And I hope that at some point in the future, I'll be able to afford to hire her to write here again.) I liked this piece, which provides tons of tips for boosting your saving rate. Saving more isn't just for building an emergency fund; it's also important for digging out of debt and, eventually, pursuing goals like homeownership and financial independence. During the Quinstreet years, the GRS audience dwindled. This was in part due to the way they managed the site. They had good intentions (and lots of smart people behind the scenes), but they didn't have the same passion for personal finance that I did. Plus, they tended to make decisions that favored short-term results instead of long-term growth. I can't fault them for their choices — they did what was right for them — but I'm sad that the community eventually collapsed. Not all of the collapse was due to blog management, though. Even if I hadn't sold the site, it likely would have faded eventually, and for a number of reasons: the rise of social media, the “death of blogs”, and increased competition from awesome new sites on a variety of niche subjects. In 2015, I “unretired” from blogging. I founded Money Boss, a site where I posted long, meaty articles about managing your money as if you were the CFO of your own life. I had fun. The site didn't grow as quickly as GRS had nine years before, but after eighteen months, the site had acquired several thousand dedicated followers. Then, in the spring of 2017, Quinstreet approached me. They asked me if I wanted to re-purchase Get Rich Slowly. Looking at the numbers, I realized it probably didn't make much financial sense to do so — but I didn't let that dissuade me. In October 2017, I bought Get Rich Slowly. What the rich do differently: Habits that foster wealth and success (18 Dec 2017) — I'm fascinated by the differences between rich people and poor people. Are the differences mostly a matter of class and economic mobility? Are people born to wealth and poverty and destined to remain there? Or are there observable differences in attitude and action that tend to lead people to specific levels of affluence? From my experience, it's some of both. Start where you are (04 Jan 2018) — My main message to family and friends who find themselves at forty or fifty and feel behind the curve is: Don't panic. All is not lost. You're not too late. This isn't a contest. Start where you are. Use what you have. Do what you can. The plight of the poor: Thoughts on systemic poverty, fault, and responsibility (28 Feb 2018) — There are very real differences between the behaviors and attitudes of those who have money and those who don't. If we want ourselves and others to be able to enjoy economic mobility, to escape poverty and dire circumstances, we have to have an understanding of the necessary mental shifts. The problem, of course, is that it's one thing to understand intellectually that wealthy people and poor people have different mindsets, but it's another thing entirely to be able to adopt more productive attitudes in your own life. The forever fallacy (11 Jul 2018) — The forever fallacy is the mistaken belief that you will always have what you have today, that you'll always be who you are today. The truth is that everything changes. You change. Your circumstances change. The people around you change. Nothing is forever. The challenge then is to balance this concept — everything changes — with living in the present. You must learn to enjoy today while simultaneously preparing for a variety of possible tomorrows. The boots theory of socioeconomic unfairness (26 Oct 2018) — Last October, I spent a week exploring the relationship between cost and quality. Quality tends to come with a price. While there are ways to mitigate some of these higher costs — buy used, wait for sales, etc. — if you want to buy new quality items, you're going to pay a premium. Because of this, quality is often something reserved for the rich. Like so many things in life, this is fundamentally unfair. But that's how things are. Why frugality is an important part of personal finance (31 Jan 2019) — Depriving yourself of certain “standard” choices now means you don't have to lead a life of deprivation when you're older. When you choose to spend less, you're not just boosting your bottom line. You're also gaining the time and freedom that would have been required to earn that money. Thrift isn't deprivation. It's wealth. Saving regret — and how to avoid it (27 Feb 2019) — Very few people regret saving money. In fact, research shows that less than 2% of people would save less if they could re-do their earlier life. On the other hand, two-thirds of people wish they'd saved more when they were younger. Poorer people tend to regret not saving most of all. The bottom line: To avoid regrets when you're older, save more now. I won't lie. While I'm glad to be back and I've enjoyed the past eighteen months, it's also been tough. I have lots to say, but I've struggled to figure out exactly how to say it. Blogging has changed. Expectations are different. I am different than when I started this site. I'm constantly wrestling with questions like: How often should I write? (Once a week? Three times a week? At random intervals?) Should I share only new stuff? Or should I republish updated material from the archives? In the olden days, I used to share tons of things from other sites. Should I continue to do that? Or should I focus on my own thoughts? How long should my articles be? (A few hundred words? Or…a few thousand?) What topics should I cover? If you walk through the GRS archives, you can see how I've struggled to find a rhythm for Get Rich Slowly 3.0. I'm not worried, though. I know I'll figure things out. In the meantime, I'm having fun. I hope that you are having fun too. And, as always, if you have any suggestions and/or requests for things you'd like to see around here, please let me know. I want GRS to be a useful resource for you — for all of you. There are 33 reader responses to "This blog is now a teenager: Thirteen years of Get Rich Slowly". I’ve been a reader since your Money Boss phase. Grateful for your backlog. I’ve enjoyed your transparency and I’ve learned new perspectives from your writing. It’s tough to rebuild something a second time. You have to fight your own expectations (GRS3.0 not growing as fast as GRS 1.0). You are a gifted writer. Your body of work stands the test of time. As you move forward, create your future from your future rather than your past. Where do you want GRS to be in 10–25 years? Harvest your best lessons from the past but as you’ve said blogging circa 2006 is radically different from 2019. Experiment with vlogging. Maybe also look for an audience via Medium.com or even LinkedIn. Drive traffic back to GRS. Here’s to a bigger, better, and deeper version of GRS as you create GRS2019. You are simply my favorite voice in this space. Wisdom, humor, kindness and tough love all rolled up in the smoothest of mellow prose. I have been lucky, and haven’t needed much advice. But I still read every post. And I’m very glad you do what you do J.D. I just love your blog. I think I like hearing about your lessons from your real life the most. They seem to impart more wisdom than just money advice. Love your articles, JD! Been a fan for years. I think I came here from a Bogleheads discussion originally. You have soo much archive material, I think it’d be great to continue share old stuff sometimes and give it a face-lift if necessary. That way you don’t have to come up with new ideas as much and we get to revisit your old stuff which is still just as relevant today as it was then. As you noted, there are a lot of blogs out there – what brings me here is the sincerity and uniqueness of your individual voice. The aggregation sites are good for gathering a variety of viewpoints quickly but they don’t have a consistent voice/personality behind them. Having met you in person (waves hello) just reinforces my appreciation of your authenticity as a real person working their way through life. That’s the value of this site to me. That makes me a reader for about 11 of them, I would conservatively estimate (including your other blogs in-between). “You do you” as a comment above said is what keeps me coming back. Personal views on things, your voice is what matters. Financial advise is aplenty out there, and technically I don’t seek it. I draw from it more of an affirmation I am not along, lets keep plugging, we shall inspire each other sort of thing. Best to you with dealing with depression, health concerns, and blog up-rise for additional financial perk. Congratulations! You’re one of the best writers out there. Your writing is approachable and genuine. That’s why I’m still reading after all these years. I think I found GRS around 2007. You’re doing pretty well with 3.0. You’ve been more consistent than at Money Boss, from what I recall. Congratulations on having a teenager! I’ve been a huge fan of your writing for years and appreciate your voice. I’m glad you’re back at GRS and happy whenever you publish something new. I also enjoy dusting off older stuff, since there is so much good content in the archives. I’ll be spending some time on the links in this article! HAPPY BIRTHDAY G.R.S.! This is a useful, down-to-earth site. Congratulations on 13 years of helping other people find their way. It’s a great thing to be doing, J.D.! I always read your posts with gratitude and enjoyment. Keep up the great work. I’ve always thought that you show too much deference to Quinstreet. The fact that you have NDAs with them makes it even harder to decipher what your “true” feelings are vs what you’re allowed to say in public with your name attached. To that point, I’ll say that I absolutely fault Quinstreet for the way they managed things, especially by focusing on short term profits at the expense of short term gains. It’s just dumb, especially because at the end there was nothing left. You’re right that things could have changed anyway, but part of that just comes with the territory of being a one man show. When *you* are the product, what’s left when you’re gone? When the other writers came in GRS many of them had a clear political side and the whole tone changes from curiosity to lecture. It wasn’t fun so I stopped checking in. As far as what I enjoy as a reader and would like to see: I think my ideal would be 3 articles per week. They don’t all have to be big, but maybe one original piece, one reprint (throwback Thursdays? ), and one guest post (I know sometimes those are more work than the original work) or short form/reader discussion. A possible short form would be pulling one of the more interesting things you’ve pinned with your thoughts about it then we can discuss in comments. A number of those I have thought would lend themselves to discussion. I like the idea of a throwback once a week. I would be good with two a week. Even if one is a throwback. Although in this day and age I think new readers expect more from their source of information. I started reading the site 12 years ago and came back when you repurchased it as I love your writing style. New readers might not be as patient as me as they expect more frequent articles. Of course that all depends on what you want out of the site. If you want to slowly grow the site picking up a few readers at a time and make it a lifestyle site then less frequent is fine. Also, your articles early on were very much focused on frugality and the growing pains of getting out of debt because that was where you were in life then. I related to those articles then as I just graduated college and was struggling to pay off student loans and some credit card debt. Today, I am where you are now in your financial life and relate to your new articles that are more philosophical, but the majority of the population is still struggling in that earlier stage. New ones are added every day as they graduate college and are searching for help. Since you are not at that stage anymore and might not have the interest to write about those early stage topics anymore, some guest posts from people who write about those stages might help bring more traffic and you can add your commentary with reference to your experiences. Overall, I agree with the posts above as your tone and style of writing is what brings me back time and again. There will be plenty of people that would love to read your articles if you wanted to write more so it really all depends on your aspirations for the site. Keep up the great work! What to add my vote to the similar schedule. 3-a-week, with one throwback and one guest sounds fantastic, what a great idea! On the flipside, it was amazing to see the readers go insane over certain guest posts – the one that really sticks in my mind was from the very low income author who posted about using two shampoo bottles for every one purchased and filling each with half shampoo, half water to save money…the readership at the time was NOT digging that. I’ve been reading GRS since before you originally sold it. I’m glad you’re back, and I think you need to write whatever inspires you. A regular schedule sounds like drudgery. I think updating older posts would be beneficial for readers. You have a wealth of information in the archives. Short posts with whatever’s on your mind would be fine. It’s been at least eight years I’ve read your blog; possibly longer, but 2011 is the first record I have of forwarding a page to my wife via chat. ;) Yours the first personal finance blog I got into; it really got its hooks into me, and we owe a fair bit of our 41.3%-to-liquid-millionaire status to you. It cannot have been easy to share some of the wisdom you’ve learned the hard way over the last baker’s dozen years — thank you, very much! Happy Birthday GRS!. I have been following you since the original site. As a lot of folks, I eventually tuned out after you left and later followed Money Boss and back to HERE! I rarely comment, but today I was compelled to do so because if I don’t, how will you know? How will you know that this is basically the only blog I follow. The way you write things, explain things, and arrange things aesthetically on your site just appeals to me. As others have mentioned, the personal articles you write are ALWAYS my favorite. I wish you many more years and thank you for making personal finance readable! I discovered this site sometime late last year, and tend to check-in weekly. I really appreciate your honesty, unique voice and down-to-earth vibe. I’d be happy to see articles posted once or twice a week. I find your personal stories (finances in the context of your life, vs just theory) and interviews/discussions with others in different life phases most compelling. JD – As your archive is packed full of great reference material – Can you start a “throwback Thursday” post, where you highlight a past article from the archives. This would help your posting consistency and highlight some of the articles from MoneyBoss or previous GRS postings….just some food for thought. I like the idea of a “Throwback Thursday” feature where I bring forward and update older articles. I’ll make it happen. Thanks for the suggestion, everybody. It’s also a way of introducing new people who aren’t as far along their journey to old JD. As you’ve pointed out: they have more in common with him. And you can still add some wisdom from new JD. J.D. – First time caller, long time listener. I’ve been along for the whole journey, small blog, Globo Gym ownership and back to your voice. It seems what resonates with me and most others that comment is your “Voice”. Your inquisitive, open, and common sense way of approaching the subject of personal finance is endearing. You hint to the question, what should 3.0 look like? I feel us readers are here because we enjoy your approach and your tone. You don’t pretend to know it all and are open to finding the best way forward be it thru interviews, deep subject dives or your real life (sometimes imperfect) experiences. That said, moving forward I’d continue to be interested in articles YOU find interesting (outside sites), subjects that have been covered but pop into your head (Throwback Thursday as mentioned) and continued honest dives into personal finance wrapped into real life. My own journey as well as many others who read this site owe you a big ol high five for your time in unpacking these subjects. Please know that my family is better off for the words you have written. Happy 13 sir. Back in 2008 I had a small business and was financially overextended with the expectation that life would always be better and so I’d catch up eventually. Then the economy crashed, my clients went under, I followed next, and found myself hanging off a financial cliff. I looked for solutions all over the internet, and there was a lot of marketing BS about “debt consolidation” and other nonsense. Products to buy. But then I found this blog, and the articles and the discussions showed me a path forward in a way that wasn’t scummy or trying to sell me a something. So I stuck around and read and discussed and learned some more, until I think I learned what I needed. The discussions were really a great way to hash things out for me. And some times I could disagree with something J.D. said, but I always found that his content came from a place of integrity. Meaning it was always something he believed, not a sales pitch, and that is something I can respect. Now we might be heading into a recession, or maybe not, nobody knows the future. But whatever happens will find me in a much more solid footing because I found this place 10 years ago. I’m sure a lot of other people can say the same, maybe with varying dates. As for 3.0… I think maybe a good rhythm could be to post an article, let the discussion develop, and post the following one after discussion winds down? Not so much an preset pattern, but an “organic” one, if you will. Anyway, just an idea. Best wishes with whatever is next! “Now we might be heading into a recession, or maybe not, nobody knows the future. But whatever happens will find me in a much more solid footing because I found this place 10 years ago. I’m sure a lot of other people can say the same, maybe with varying dates. Congratulations on the milestone. I started reading during GRS 1.0 and worked my way through the entire archive before you sold the site. I continued reading during the 2.0 era, also read Money Boss, and I’m still here. Just wanted to add my voice and agree with many of the commenters here. Even if I’m not directly interested in the topic at hand, your voice and approach, and my trust that you’re earnestly exploring options or enjoying things, makes this one of the very few spots on the internet I have bookmarked. I only discovered this place around three years ago, so I can’t draw on an extensive history here, but I do generally like the idea of resurrecting some of these old topics/posts. People are assuredly at different stages of their journey, so while honesty to your own current experiences is what’s so compelling it doesn’t hurt to periodically review past themes. Personally, I’ve got a hankering to reread stuff about index investing! this blog is a wealth of insight and wisdom. thanks for all you post. This blog (like many in the FI/RE community) have an authenticity and honesty to them that makes them personal, compelling – real. i started searching for guidance in personal finance blogs to pay off my student debt and buy a home. i think i only started reading here after you bought GRS back. Maybe I only know the “current” JD, but i actually enjoy the big-picture, thought-pieces the most, even though its not what i originally came looking for. I think some other blogs like “financial samurai” and “afford anything” provide the nuts-and-bolts (i assume like your blog in the early days), but i come here (and to “early retirement dude”) for the soul. I’ve been a reader almost since the very beginning, sometime in mid 2006. I don’t remember how I found the site but it very much spoke to me then as I was going through very difficult financial times. Fast forward to today and things are much better. I attribute a good amount of that to the articles here (and the Forums, please bring back the Forums!). It was so much that I needed help figuring things out, I knew what needed to be done, but the camaraderie of others going through the same process really was empowering. Thank you for the many wonderful years, and I hope many more are to come! Congrats JD! What an amazing 13 years you’ve had. It was fascinating to read your journey. Here’s to another 13 years of great GRS content. A long time reader here – I found your 1.0 blog in 2008 and have followed you ever since. It is your writing and respect for the individual and what works for that person that has continued to interest me over the years. Your articles are thoughtful and far from cookie cutter! I may already know a lot about personal finance but I keep coming back because you are always trying to get us to learn and think! I’ve been lurking for 13 years? That doesn’t seem possible…but yeah, I guess so now that I think about it.